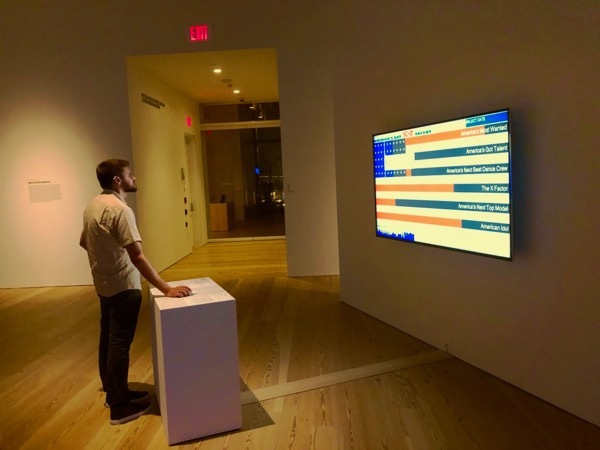 SimpleTEXT – 2003 | JONAH BRUCKER-COHEN, PH.D. SimpleTEXT – 2003 – JONAH BRUCKER-COHEN, PH.D.
SimpleTEXT is a collaborative audio/visual public performance that relies on audience participation through input from mobile devices such as phones, PDAs or laptops. SimpleTEXT focuses on dynamic input from participants as essential to the overall output. The performance creates a dialogue between participants who submit messages which control the audiovisual output of the installation. These messages are first parsed according to a code that dictates how the music is created, and then rhythmically drive a speech synthesizer and a picture synthesizer in order to create a compelling, collaborative audiovisual performance. SimpleTEXT was originally funded by a commission from Low-Fi, a new media arts organization based in the UK. “State of the Artists”, by David Pescovitz, TheFeature.com (cached), 4/22/04. 2. Limehouse Town Hall, London, UK, 11/29/03 UK. 3. Institute of Contemporary Art, 3/20/04 @ London, UK. 4. Vooruit, 5/14/04, Gent, Belgium. 5. Pescara Electronic Artist Meeting, 5/22/04, Ecoteca, Pescara, Italy. 6. Garage Festival 2004, 7/23/04, Straslund, Germany. 7. Mor Festival 2004, 8/22/04, Charleville Castle, Tullamore Co. Offaly, Ireland. 8. Art Futura 2004, 10/29/04, Barcelona, Spain. 9. CC Revolver Live Art Event, 7/15/05, Mardyke Complex, , Cork, Ireland. 10. Handheld Event, 10/26/05, New York, NY, USA. 11. OBORO, 9/16/06, Montreal, Canada. 12. Contemporary Museum“,Cell Phone: Art and the Mobile Phone” Exhibition , 1/21/07 – 4/22/07, Baltimore, MD, USA. 13. Eyebeam Center for Art and Technology, 6/5/07, New York City, NY, USA. 14. Washington College, 9/11/07, Chesterton, MD, USA. 15. 2008 Biennale of Sydney“, 6/16-9/7/08, Sydney, Australia. Baltic Art Center, Newcastle, UK, 2003. New York University, NYC, NY, USA, 2005. Sarah Lawrence College, USA, 2015.